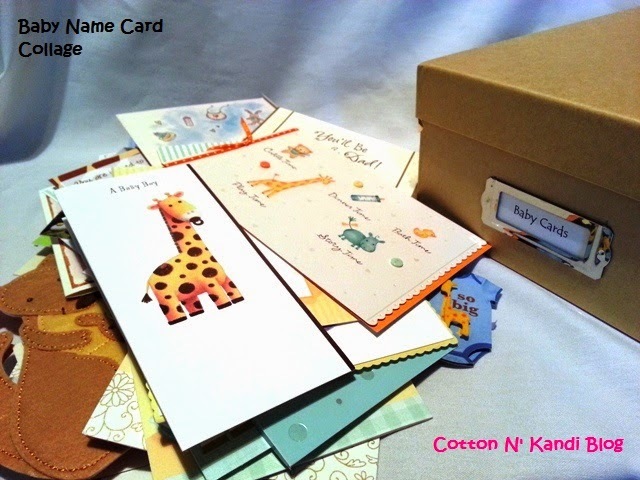 Baby Name Card Collage- What to do with all of those baby cards! 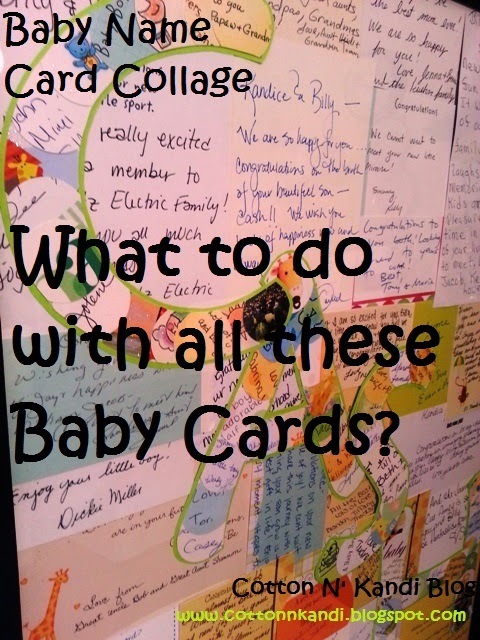 The Answer: You Scrapbook them into a collage! Step 1: I took out all of his baby cards and cut them apart- one side was the card cover and the other where they signed or wrote a message. Step 2: Glean out all of the “most” special messages, though all of them are obviously special. 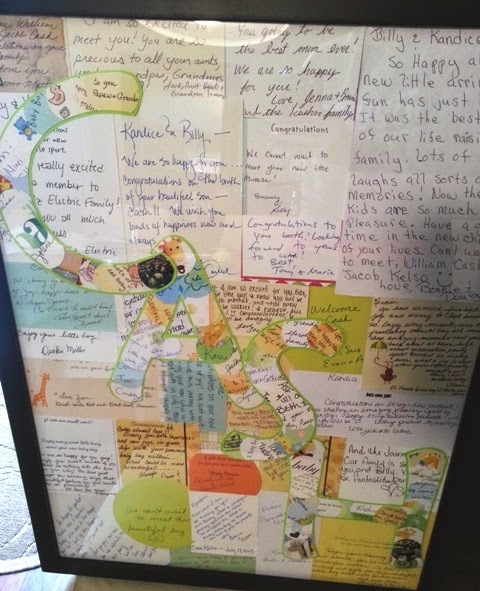 I chose our family members and messages that meant the most to my husband or myself. Step 3: Find a way for all of your messages to interlock and form a solid background. Step 4: Go to the computer and print your child’s name in a font that you like, big enough to fit in your frame. I used an 18″ x 26″ frame so I printed a size that was one letter per 8.5″ x 11″ paper. Cut out your letters and use them to help you finish the background by putting them on top so you know what they will cover. You may discover you want to crop or switch a few messages so that they are exposed more at the end. Step 5: I had the most fun here, but it also took the most time…. I was able to do this on the floor in the nursery while Cash played and he didn’t interfere too much. He did try to eat some scraps but I just moved them up to the glider chair out of his reach. 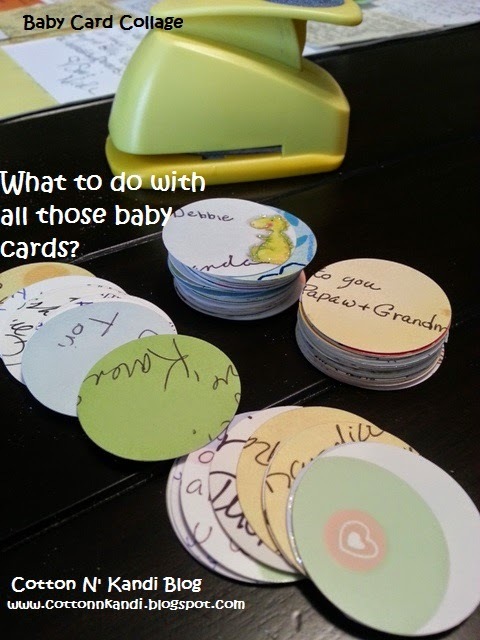 I used a 1″ circle punch to punch out pieces for the letter collage. 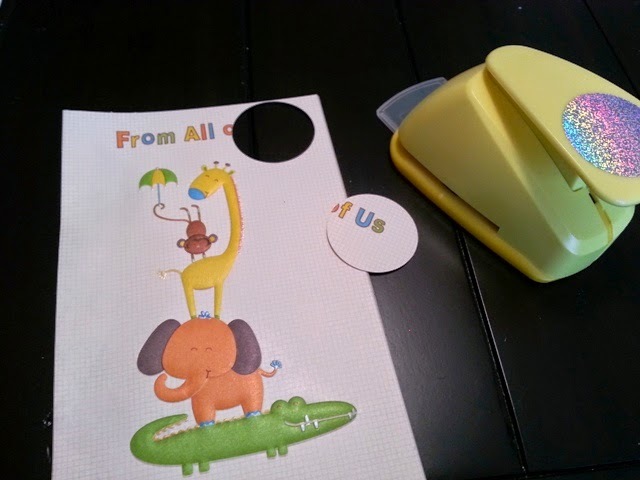 I used the front decorative cards to punch out giraffes, stars and any other cute pieces of the card that fit my “theme” for the collage, being green, yellow, giraffe. Once I had punched out all of the cute pieces I went back through the cards that didn’t make it for the background, or were just a signed card. I punched out signatures and tidbits of advice from their messages. Step 6: Arrange all of your 1″ circles over the letters so that they overlap where you want them to, and so that everything important show. Step 7: This was the MOST difficult part of the project: Once you decide where all of them are going, you have to pick them all up and glue them back down. It took a lot of patience and handwork to get everything back down where I had it. I waited for afternoon nap time to do this so I had no interruptions. Then cut out around your letters again so they are all straight edged. 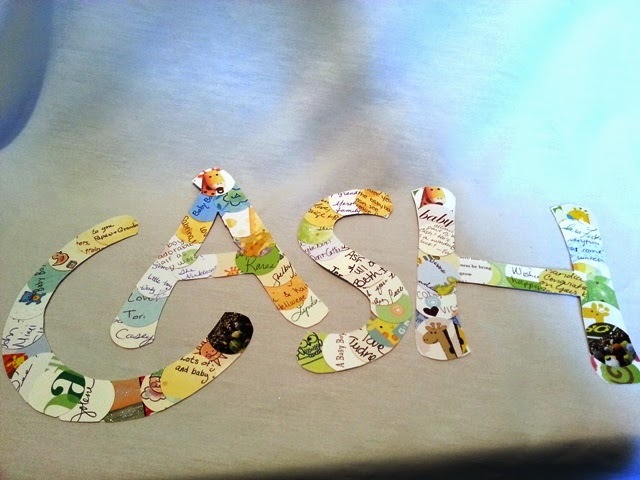 Step 8: I then glued the letters down on a coordinating, acid free cardstock 12″ x 12″ scrapbook page to mat them. Using my sharpest scissors I then free hand cut around the letters leaving a small green matting around them so that they would stand off the background just a bit, but still be subtle. Step 9: Glue your letters down on the background being mindful of the messages you want to expose. Step 10: Frame and hang! Re-read that parenting advice and precious sentiments every day!